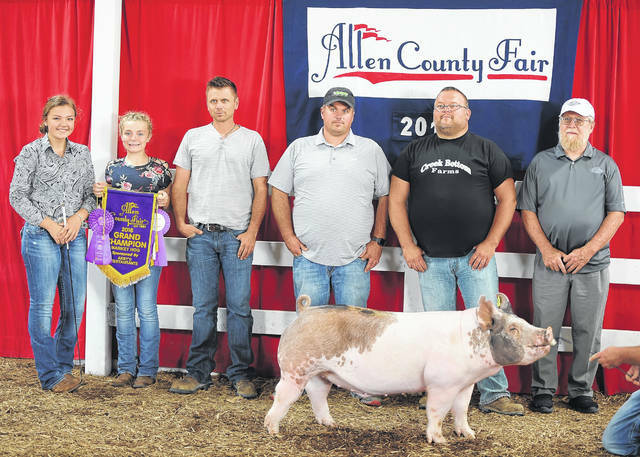 Grand Champion Market Swine and exhibitor Montana Hulsmeyer pose for a photo during Friday’s livestock auction at the Allen County Fair. Grand Champion Market Steer and exhibitor Delaney Jones pose for a photo during Friday’s livestock auction at the Allen County Fair. LIMA — For Dana and Randy Jones, they’ve seen a lot of Junior Fair auctions — at least 44 years worth — and there will probably be more before they’re done. As owners of R.D. Jones Excavating Inc., they make a point to come every year and use their business to offer premium bids on fair animals, thereby investing in the next generation. 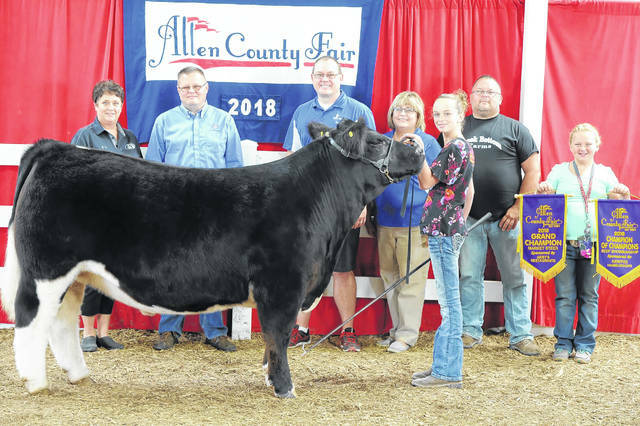 For local businesses, the Allen County Junior Fair Livestock Auction acts as a different kind of investment portfolio. Returns may not come back for decades, but for those who support 4-H, the cost of the bid does more than just get their businesses advertised throughout the show arena. For those unfamiliar with the process, bidders at the youth auction aren’t actually purchasing each animal that moves the arena. Instead, they are offering “premium” bids, or some extra funds above and beyond what young animal handlers will receive from the sale of the livestock. For area youth, that might mean extra scholarship money or an advance on the purchase of next year’s animal. For businesses, that means investing in the area’s future and getting their names out in the community. As a side benefit, many businesses at the auction are able to network with other participating organizations that have the same values, and some can even find future employees in some of the teenagers approaching working age showing the animals. In Allen County, auction chairman Bob Phillips said there’s a wide range of businesses that support the auction. From banks to ag businesses to restaurants to grocery stores to manufacturers, local businesses are out in force. Phillips estimated that on average, each individual showing an animal will receive roughly $300 premium bid they can add to their college funds. And for those who’ve gained the title of Grand Champion or Reserve Champion can bring home even more — usually an extra $1,000 on top of market value. Parents can also step up what their children gain from bids. Last year, the fair office received at least 1,000 overbids from parents, usually in small amounts. This year, they set a minimum of $25 to ensure that if parents decide to give a little, it’s at least worth filing the paperwork for the office. Phillips said he hopes it will push parents to chip in a little more to their child’s college fund. “Most people come to the auction to watch, but if they really want the experience, they need to spend $300 and bid on a kid,” Phillips said.